It's almost Halloween! Are you ready to make your jack-o-lanterns? Pumpkin carving can be fun, but it can also be a messy, dangerous job with kids. 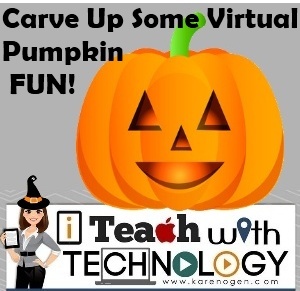 So here are a few VIRTUAL pumpkin carving sites that you and the kids can use to carve pumpkins over and over again. With virtual pumpkins there are no sticky guts, no cuts, and no tears because it didn't turn out the way you expected! Why not use these sites and the pumpkins the kids create as a jumping off point for storytelling, creative writing, discussing the properties of shapes, or word work (like discovering new adjectives)?